In Season: Nate Smith’s Roasted-Parsnip-and-Farro SaladBecause the cold helps convert their starch into sugar, a later harvest can result in an unusually sweet taproot. In Season: Fettunta With New-Harvest Olive OilIt’s the traditional way for Tuscan olive growers to show off the quality of their olio nuovo. In Season: Sautéed Kabocha Squash With Mascarpone and Maple SyrupThe fruit’s bright-orange flesh, with its perfectly sweet flavor and starchy, chestnutlike texture, is worth the effort it takes to get at it. In Season: The Marlton Lobby Bar’s Fennel-and-Pomegranate SaladThe pomegranate makes a festive, sweet-tart addition to this seasonal salad of fennel, radicchio, and feta. In Season: Mollie Katzen’s Citrusy BeetsThe Moosewood Cookbook author finds the perfect foil for beets’ inherent sweetness in the tart citrus segments and apple-cider vinegar she uses to dress roasted roots. In Season: Cauliflower-and-Gruyère Macaroni GratinA refreshingly seasonal approach to the ultimate comfort food. In Season: Sorella’s Broccoli FrittoIn spite of its year-round supermarket presence, broccoli performs best in cool weather. In Season: The Wayland’s Husk-Cherry FizzA satisfying and deceptively stiff cocktail. In Season: Michael Anthony’s Pickled Ají Dulce PeppersThe Gramercy Tavern chef uses it to garnish sashimi-style black sea bass. In Season: Philippe Bertineau’s Provençal Bayaldi With Japanese EggplantThe slender, thin-skinned Japanese eggplant has few and tiny seeds, rendering it less bitter than most and well suited for this recipe from the Benoit chef. In Season: Elise Kornack’s Tomato-and-Sandita SaladThe Take Root chef has discovered the perfect foils for the plant’s bright acidity. In Season: Esca Chef Dave Pasternak’s Corn Salad With Walnuts and GoatIs there a better reminder that summer does not officially end with Labor Day than a heap of Greenmarket corn? In Season: String BeansTry this recipe from Estela chef Ignacio Mattos, who boldly (and successfully) brings together Taleggio cheese and fish sauce. In Season: Sara Jenkins’s Agretti With Shallot YogurtThe feathery succulent has a grassy, slightly salty flavor and a crisp and juicy texture coveted by the Porsena chef. In Season: Almayass’s Fattoush With PurslaneThis recipe, adapted from the Armenian-Lebanese restaurant, honors fattoush tradition with the vibrant flavors of fresh lemon, mint, and the tart, citrusy spice sumac. In Season: Pasquale Cozzolino’s Gold Bar Zucchini a ScapeceThis fried-zucchini recipe from the Ribalta chef tastes even better the next day. In Season: Alex Stupak’s Green-Onion SaladThe Empellón Cocina chef’s take on the Mexican street-food snack cebollitas. In Season: Dan Kluger’s Roasted Fiddlehead FernsThe ABC Kitchen chef has a simple solution to intensify and fine-tune their flavor profile. In Season: Travis Post’s Chrysanthemum Greens Salad With Sesame DressingThe tender young specimens are best raw in salads, like this one from the Yunnan Kitchen chef. In Season: Phillip Kirschen-Clark’s Fresh Morel RisottoMorels make their otherworldly appearance in April. Sauté them in butter, scramble them with eggs, or try some in this recipe from the Café Cluny chef. In Season: Evan Hanczor’s Dressed Turkey EggsThey’re the Parish Hall chef’s zesty riff on deviled eggs. In Season: Recette’s Arugula Salad With Kumquats and HazelnutsChef-owner Jesse Schenker likes sweet-skinned, tart-fleshed kumquats in this simple salad. In Season: Deborah Madison’s Rutabaga ‘Fries’Over at the Union Square Greenmarket it’s still a veritable rutabagapalooza for another month or so. In Season: The Kubbeh Project’s Pomelo-Juice CocktailIts mild, sweet juice makes a nifty seasonal substitute for grapefruit in this popular Israeli drink. In Season: Jonathan Benno’s Pasta e FagioliMade with heirloom beans from California’s boutique beanery Rancho Gordo, which are firmer and more flavorful than average. In Season: Rita Sodi’s Red Cabbage SaladYou can find good cabbage any time of the year, but winter is the brassica’s finest hour. In Season: Couscous Tabbouleh With Parsley Root and Preserved LemonHugue Dufour has discovered that parsley root makes a first-rate foundation for this clever, winterized tabbouleh. In Season: Wade Moises’s Pink Grapefruit SaladThe Rosemary’s chef combines the palate bracer with some of its citrus associates in this invigorating salad. In Season: Hospoda’s Fried Egg Bread With Apple-Horseradish RelishIts super-pungent, sinus-thumping heat cuts the richness of winter’s meaty stews and braises. In Season: Pecorino di FossaThis rustic formaggio is available now at Il Buco Alimentari & Vineria as well as at DiPalo Fine Foods. In Season: Ample Hills Creamery’s Wet Walnut SauceThis new scarlet nut is a cross between a standard California walnut and a fancy French variety. In Season: Eduard Frauneder and Wolfgang Ban’s Pumpkin-Seed-Oil SpreadThe Seäsonal and Edi & the Wolf chefs combine pumpkin seeds with farmer’s cheese and spread across toasted rye or pumpernickel. In Season: Paula Wolfert’s Caramelized QuincesYou can’t really eat this ancient fruit without cooking it, and cooking it well. 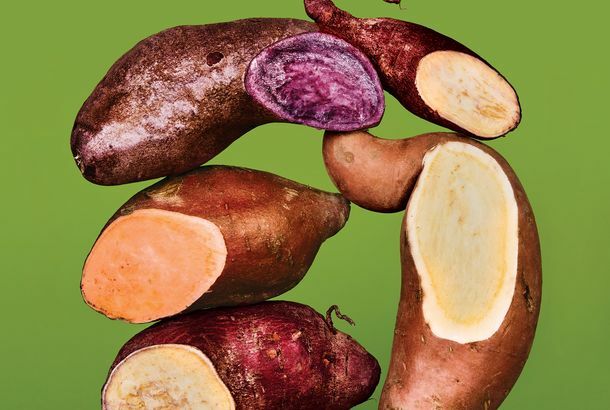 In Season: Seamus Mullen’s Crispy Fried Jerusalem ArtichokesHe likes to serve fried sunchokes as an alternative to fried potatoes. PBC’s Wet-Hopped ‘Harvest From the Hood’ Arrives Just in TimeIt arrives just in time to mitigate pumpkin beer fatigue.